Calls to give Bletchley Park more aid have been rejected by the government. A petition in the House of Lords asked for more central funds to be given to the code-cracking site to repair its dilapidated buildings. The government said Bletchley was getting financial aid and rejected a request to associate it with the Imperial War Museum. Bletchley Park chief Simon Greenish, said he was "disappointed" by the reaction to the plea for aid. The call for more aid came from peers who are the children of people who met while working at Bletchley Park during World War II. Labour peer Baroness McIntosh of Hudnall said she "wouldn't be here" had her parents not met while at Bletchley. Similarly, said Lord Clement-Jones, his parents met in Hut Three at Bletchley as did the parents-in-law of Lord Wallace of Saltaire. 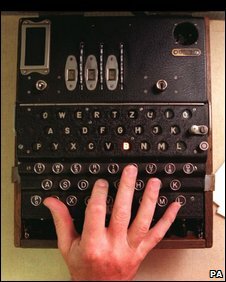 During WWII, Bletchley Park employed thousands of people who helped to crack the signals of the German armed forces. Work done on many of the machines developed at the site to speed up code-cracking directly contributed to the development of modern computers. Lady McIntosh said that although building works were going well, and the numbers of visitors to Bletchley was rising, it still faced difficulties surviving from day to day. The Department for Culture, Media and Sport (DCMS) should reconsider its "apparent unwillingness to support this very important project", she said. Lord Davies of Oldham responded for the government to the petition saying that Bletchley had received a grant of £330,000 from English Heritage in 2008 and had been offered a similar amount to help with repairs. He added that the DCMS was "all too well aware of the necessity of ensuring support for such an important historic site". In a statement, Bletchley boss Simon Greenish expressed his "disappointment" at the official reaction to the funding call. While "grateful" for the cash provided for repairs, Mr Greenish said Bletchley Park had other costs to pay. "It is the day-to-day operational costs associated with running this ageing and dilapidated site that the Trust battles to meet," he said. He added that the Bletchley Park Trust was working on a "major" bid for funds from the Heritage Lottery Fund. Success in that bid, he said, would "develop the site into the world-class education and heritage centre it deserves to be."